The immediate elder brother of the Kaduna state governor, Nasir El-Rufai, AVM Aliyu Ahmed El-Rufai (rtd), is dead. According to the governor’s spokesman, Samuel Aruwan, in a statement, El-Rufai passed away on Saturday in Abuja. 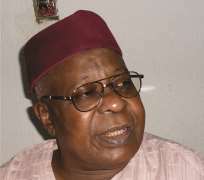 "The elder brother of Governor Nasir Ahmad El-Rufai, AVM Ali Ahmad Rufai (Rtd) is dead. AVM Rufai, who died in the early hours of Saturday in Abuja,was born on 10th November 1948 in Zaria, Kaduna State. He was commissioned as an officer in 1972, and retired in 2002 at the rank of Air Vice Marshall after a meritorious military career. He held different positions and commanded various formations while in service and attended several courses in Nigeria and abroad. He is survived by his wife, Hajiya Safiya Rufai, six children, brothers and sisters. His surviving siblings include Malam Nasir Ahmad El-Rufai and Alhaji Bashir Ahmad El-Rufai. The janaiza will take place at the Sultan Bello Mosque, Ungwan Sarki, Kaduna by 4pm today (Saturday) 19th January 2019".